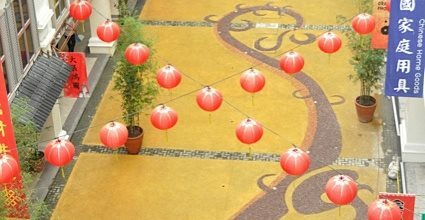 In Binondo, Manila’s Chinatown, pervious concrete was used to create a dragon design, which symbolizes prosperity. 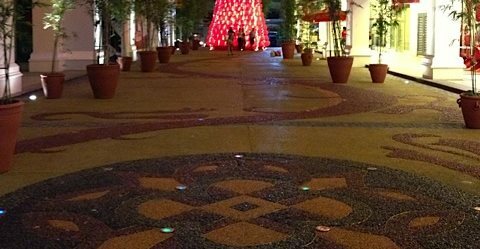 The combination of pervious concrete with resin bonded aggregates allowed the paving to be highly decorative and durable in the harsh climate. A circular design was created at the mall’s entry. 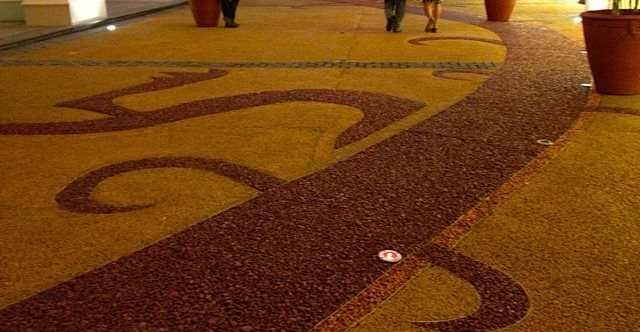 Visitors to the mall often stop to admire and photograph the unique paving. Pervious concrete was selected for this project because of its LEED point qualifications and decorative options. Early this year I participated in the World Bex Trade Show held annually in Manila Philippines. I had the opportunity to speak on the decorative concrete trends that are taking place within South East Asia and the future of decorative concrete. As I walked the show it felt very similar to the construction trade shows we have in the United States. Builders, architects, business owners, students and home owners walked the World Bex floor of Manila’s largest convention center. I found many extremely knowledgeable individuals sharing quality building materials and practices to all those in attendance. I have been told World Bex is one of the largest construction trade shows in all of Asia. I have always found the Philippines a great place to work. The people are kind and show a love of family, life and work to all whom they come in contact with. On my first visit to Manila after a long day of decorative concrete training and product development I was treated to a traditional Filipino Bar-B-Q complete with a karaoke machine and the local favorite Balut. For those of you who don’t know, karaoke is the unofficial past time of the Philippines. I did sing but I will not say how I sounded. While walking the World Bex trade show I came across one Ronnie Traballo a local Filipino contractor whose family has been installing landscape and hardscape work in the Philippines for 40 years. They are a large company that treats their employees like family. Ronnie specializes in decorative concrete and has many strong relationships with decorative contractors throughout the world. Ronnie travels frequently to US trade shows like the World of Concrete and the Concrete Decor Show. Ronnie and I speak frequently and recently I contacted him to see if he had any projects that would be worth sharing with the decorative concrete community. Ronnie was happy to share with us a large renovation project and immediately shot over pictures of a recently completed project. 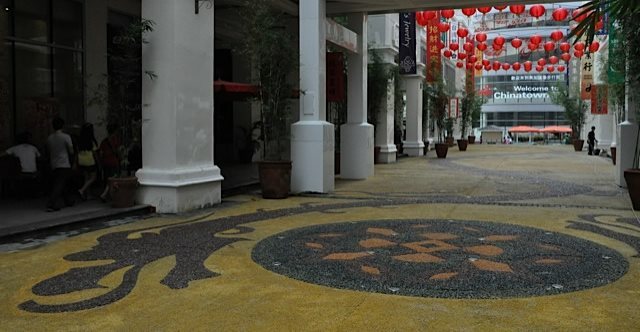 He explained a combination of pervious concrete and resin bound aggregates were used to renovate historic part of Manila said to be the oldest Chinatown in the world. I was intrigued and you can see our question and answer conversation below. Why was pervious concrete specified in the project? Originally, concrete pavers were specified for this project. However, the decorative aspect of this project could only be completed with concrete type products. Pervious concrete had the characteristic the architects were looking for in a paving system. The combination of pervious concrete with resin bonded aggregates allowed the paving to be highly decorative and durable in our climate. 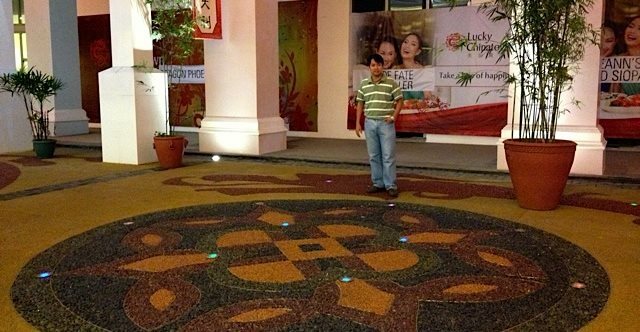 Does pervious concrete have a history in the Philippines? Pervious concrete is relatively new to our market. We initially introduced this as part of our green solutions back in 2009. We received no immediate responses as no one wanted to be the first to try this system. Now in 2012 we have installed several projects and feel confident selling pervious concrete. Consumers are starting to see the benefits of pervious concrete and it makes selling easier. What is the relationship with the design of the concrete and the environment it was installed in? Or in other words is there a story that goes with the design? Megaworld Corporation, a leading real estate developer in the country, came up with the concept of reviving Binondo - an enclave in Manila primarily populated by ethnic Chinese living in the Philippines, and said to be the oldest Chinatown in the world, established in 1594. The concept was to reinvent the lifestyle of residents and tourists of Binondo, with an upscale commercial development that offers old charm with a modern twist amongst the wholesaler complexes in the area. Luckily Chinatown Mall, is a 108,000 square-meter- full-scale luxury shopping center, comprised of five levels of top-class shopping, dining, entertainment, with a deep-appreciation for Binondo’s Filipino-Chinese heritage. The interiors are filled with bright lighting and accents that give you a feel of royalty and luxury. The exteriors, to complement, are emphasized with the Chinatown Walk, an exciting street development recreating the Chinatown of old, complete with pre-Spanish era-inspired architecture and authentic Chinese stores and establishments. The circular design at the entry and the dragon on the entire walkway, symbolizes prosperity in the Chinese culture. What was the response of the end user once the decorative pervious concrete was installed and finished? At present many people flock to the area and take pictures, I think they love it. Do you see any challenges promoting pervious concrete in your area?As pervious concrete is relatively new to Philippines, we are focusing initially on light traffic and have not specified or used it for vehicular traffic. We are working toward a greater understanding on the technical aspect of pervious concrete. We are testing water flow and absorption rate to determine the kind of drainage needed so we can specify pervious concrete as a flood mitigation solution. Can you speak on the challenges Manila and the Philippines in general faces with flooding during the monsoon seasons. Do you see pervious concrete as a way to help mitigate some of these issues? Yes, a pervious concrete system that is properly designed (greater understanding on water flow rate to determine the underground water absorption rate) is critical to make it a working system. It can definitely mitigate flooding, but we are not overselling this idea since it is not a cure-all with the kind of heavy floods that are now occurring. We are focusing on the LEED point qualifications and equally the aesthetic aspects compared to conventional gray concrete roads and parking area.